I Robot - [Japanese] 2 Disc DVD + Ltd Ed Replica "Sonny"
Back when I first got an HD TV and a Blu-ray player, I went through my movie collection checking out the DVDs that definitely needed a Blu-ray upgrade, and those discs that scaled up just fine. 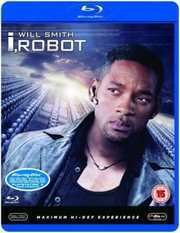 I, Robot was one DVD that looked spectacular when scaled up, smooth in motion, and rich with detail. That was one DVD I would definitely not waste money on double-dipping to Blu-ray. But when there is a sale online that has the disc priced for less than five pounds delivered, it’s hard not to change your mind. Besides, I like I, Robot enough to want it in high definition despite my earlier frugal conviction. Detective Del Spooner really shouldn’t be back at work, not following the trauma that he has just suffered, leaving him plagued by nightmares, and with an irrational hatred of all robots. That’s bound to cause friction when he is called to investigate the apparent suicide of Doctor Alfred Lanning. Lanning was the man who created robots, and practically built the whole industry, including the biggest company in the world US Robotics. While Spooner may have an antipathy to robots, he does have a connection to Lanning, which motivates him to investigate. The thing is, he was called by Lanning’s hologram, and it seems the Doctor has left him something of a cryptic message. USR assign robot psychologist Susan Calvin to help him, and Spooner's suspicions are raised when it turns out that surveillance footage of Lanning’s office is missing, and that the window he apparently jumped through was made of safety glass, and would need excessive force to break, the sort of force a robot would have. But robots are hardwired with the Three Laws, they simply cannot harm humans, or allow humans to come to harm. Yet as Detective Spooner says, laws were made to be broken. The film gets a 2.35:1 widescreen 1080p transfer that looks exceedingly sweet on this disc. The image is clear and sharp, colours are strong and consistent, and detail levels are excellent. There is no problem with shadow detail or contrast, and it looks fantastic, certainly a step up over the DVD. You also get a DTS-HD MA 5.1 Surround English track, as well as DD 5.1 French and German with subtitles in these languages and Danish, Dutch, Swedish, Norwegian and Finnish. The audio is fine, robust when it comes to action, immersive where it needs to be and it keeps the dialogue clear throughout. If there is any DNR or post-processing to enhance the film for HD, it’s hard to tell in a film so reliant on digital effects, but I never noticed any waxiness or flatness to the image. One disc in an Amaray case, which boots to an animated menu, although it’s hard to tell just which option you have highlighted when navigating. It certainly looks as if it’s packed with extra features at first glance, but then you’ll realise that it actually has less than the two-disc DVD release, so you may not want to throw that away, or donate it to charity just yet. You get one of three commentaries from the DVD, the one with director Alex Proyas and Screenwriter Akiva Goldsman. Most of the extras are in the Behind the Camera section. Day of Days: I, Robot Production Diaries runs to 76:33. There are 10 of them in total. There were 9 on the DVD, but ran 15 minutes longer, so there has been some selective editing for the Blu-ray. The CGI and Design featurettes run to 21:29. The Sentient Machines: Robotic Behaviour featurettes run to 35:58. Those in The Filmmaker’s Toolbox last 8:43, and the four Extended and Deleted Scenes last 6:48. There is a trivia track that you can access from the film during playback. There is also an In Movie Features option that allows you to access the featurettes, the trivia track and the commentary during playback, using the colour buttons on your remote. All of the video extras on this disc are in SD. There is a lot to be going on with here, but all in all, there is well over an hour of extra material on the DVD that doesn’t make it this Blu-ray release. I still love and hate this film. It is the oddest reaction to have to a movie, but I have to temper my passion for it with my innate dislike of the Hollywood conveyer belt. This is the quintessential summer blockbuster. It’s an action flick with loads of CGI special effects, cheesy dialogue, and a plot structure that is so well worn that it’s threadbare. It’s a film to take a bucket of popcorn to, to indulge yourself in, and to not have to think about again on your way home. Except that there is a whole lot in I, Robot to think about, if you let yourself. I’m not all too enamoured of the CGI-fests of the summer box office, but even I have to admit that the CGI in I, Robot is so perfect for the film, so well implemented that you quickly forget that it is there and just relish the storytelling. There’s never a moment that takes you out of the film that screams, ‘Hey look at me, I’m a special effect, I cost $10 million.’ And that especially includes the star of this film, Sonny the robot, brilliant realised and channelling a hundred percent of actor Alan Tudyk’s performance. But it is a Will Smith movie from before he discovered acting. He used to play Will Smith in all the movies that he was in, or minor variations thereof. And you could count on the script being coloured with Will Smith-isms. It’s also chock a block with cartoon action sequences, whether it’s the tunnel chase, or the bike stunt. There’s a lot of defiance of the laws of physics here, and it’s something that takes me out of a film more and more, the older I get. Then there is the cinematography. What happened to holding the camera still and actually showing the action? The climax of the film, the battle atop the catwalks is obscured by a spinning camera technique that not only hides the action; it also makes me dizzy to watch it. And don’t get me started on the utterly blatant product placement that seems compulsory in films now. That’s the hate. But the reason I love this film is because it is so faithful to Asimov’s work, it’s an ode to his robot stories, it’s an amazing tribute to his legacy, and I get a thrill every time when I realise that this movie is not about good guys and bad guys, it’s not just about big explosions and fantastically expensive action sequence. At heart, this film is about the three laws of robotics, the concepts that drove Asimov’s robot stories, and what inspired generations of sci-fi writers and fans. 1. A robot may not injure a human being, or, through inaction allow a human being to come to harm. It isn’t all that surprising of course, as Asimov created the most compelling stories with these laws at their heart. What does surprise me is that the ideas translate so well to the big screen, giving us something a lot more philosophical and intellectual than just your usual summer blockbuster. Of course there are certain aspects of this film that may have purists scratching their heads, the rampaging robots for one, and Sonny’s behaviour for another, which seem to stray beyond the three laws. Again, the film may deviate from the pure concepts of the three laws, but it does so by still remaining scrupulously faithful to Asimov. In one of Asimov’s later novels, he bridges the world of robots and the world of Foundation by postulating a Zeroth Law, one that takes precedence even over the three laws. You can read Robots and Empire to find out more, but it is so perfectly echoed in the plot of this film that I get a little tingle just thinking about it. Admittedly Sonny’s behaviour isn’t pure Asimov, but one of the writers who played in Asimov’s sand pit, Roger MacBride Allen created a no-law robot in a book called Caliban, a robot that was activated and then almost immediately accused of murder. While Sonny isn’t strictly a no-law robot, the journey that he goes on in this film is remarkably similar to that faced by Caliban in the novel. Finally, I, Robot is structured just like one of Asimov’s classic robot murder novels, with a robot hating detective effectively partnered with a robot to investigate a murder, a murder which against all the three laws, and all the odds, looks as if it was committed by a robot. The script is pretty tight too, with no major plot holes that I can see, and the way it unfolds, the breadcrumbs that are left for the audience to pick up, along with Spooner, really make this film a joy to watch. So there we have it, an intellectual movie wearing the clothing of a summer action flick. The extras on the 2-disc DVD were a case of quantity over quality, so it’s not as significant a loss having the extras pared down on the Blu-ray, while the audio video quality is just the step up you’d expect. Well worth the double-dip!